Greetings readers! I’ve recently become part of the Game Night Blog Carnival, wherein once a month some of us RPG bloggers sit down and talk about the board, card, and other miscellaneous games we’ve been playing. So today I’m going to do a quick review of Thunderstone – a very sword & sorcery flavored deck building game from AEG. Deck building games are a pretty popular thing, the biggest contenders probably being Dominion and Ascension, having never played either of these games I can give no comparison. I can say that the themes of those games have never interested me much which is probably part of the reason I was never drawn to them, the flavor of Thunderstone however – is right up my alley. The only other deck building game I’ve ever played has been Alderac’s own Nightfall, I was drawn to it for obvious reasons (vampires, werewolves, etc.) but still, I can only say it was fun at best and at worst it seemed slightly unvaried to me. My sole con demo game of Nightfall was fun, but gives me very little ground for fair comparison though so please take my review with a grain of salt, knowing that I am a total deck building game newb. The overall look of the game is very high fantasy sword & sorcery, all of the artwork was done by Jason Engle, it fits the game’s theme very well. The cards themselves are a bit textured and use similar card stock to many other board and cards games out there. They are not CCG cardstock quality by any means though, but still very acceptable quality, colors are very vivid too. While opening my packs I found strange silvery debris on my hands, similar to glitter. It may have been from the cellophane they were wrapped in, a thorough hand washing fixed that problem right up though. The overall layout of the cards can be a bit daunting at first glance, but once you have played the game you’ll easily be able to identify each one. Though I can’t help but think some clearer symbolism could have helped ease the understanding the game mechanics for new players, at least a bit. The game basically emulates an adventuring party delving through layers of dungeon to smite foes and seek out the Thunderstone, which triggers the stopping point of the game. When the Thunderstone card reaches its designated point on the playing space, everyone stops and counts up their cards to see who has the most victory points to determine the winner. Thunderstone starts off as any adventuring party would, small, weak, and with very little resources who gradually grow in power, smiting monsters for fun, profit and power! 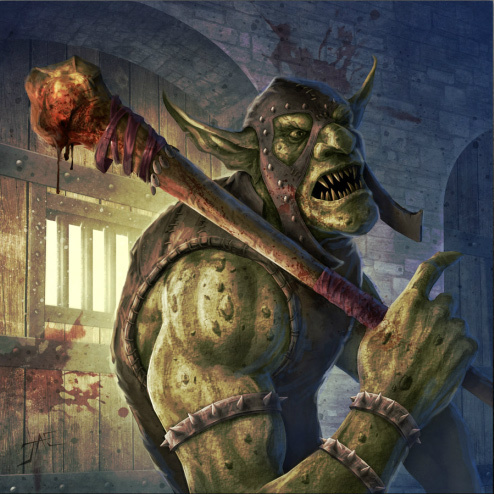 There are a lot of thematic elements which affect dungeon gameplay such as how deep you delve into the dungeon affects how much light you need to properly fight monsters without incurring a penalty, some monsters can only be damaged by magic or certain weapons, spread diseases, destroy your gear, etc. This all sounds very complex, but after just a few rounds the game will click for most players, and you begin to recognize the solid, fast, and fun gameplay. Another option you can choose to do on your turn is to visit the village, this emulates dropping by town for supplies and reinforcements such as items, weapons, spells, heroes, and more. This is really the most common way to build up your deck and acquire gold for purchasing items, heroes, and spells from the village. Aside from defeating monsters, some of which serve as “trophies” that can also give you added bonuses in combat, the village is your best bet if you want to hone your deck into a well oiled machine. There is also a third option for your turn and that is simply to rest, allowing you to ‘destroy’ (remove from gameplay) any card of your choice, namely disease cards acquired from some monsters or to thin your deck of cards no longer needed or just wanting to streamline your deck for efficiency. Some cards have village effects, and some have dungeon effects which will only trigger in their respective environments, depending on what you choose to do with your turn. These effects really create some unique combos and opportunities for you to get your monster-slaying-and-taking-its-stuff on. Another layer to the core mechanic of the game (killing things and taking their stuff while racing toward for the grand prize) is that once you kill monsters they also go into your deck, allowing you to gain benefits such as attack bonuses, added light for your dungeon crawls and gold generation when you visit the village. And where would killing monsters be without getting XP? You earn experience points for each monster you vanquish, which in turn allows you to level up your hero and militia cards turning them into precision killing machines of varying strengths and weaknesses. The random combination of determining which cards is fun and keeps gameplay varied from session to session, however there are times when this randomization can totally bone you and leave you with very few or zero options to tackle certain situations. For example if your random village card/hero generation doesn’t match up with your monster type generation you could wind up with a slew of monsters that only take damage from magic, yet very little or no means to actually deal magic damage to them. Though rare, when this happens combating monsters can feel a bit futile. However there are some pretty neat tools like this one (thanks @Asmor), that can be found online that will help you avoid these types of situations. The game does a very good job at emulating the feel of an intrepid band of adventurers crawling through a dungeon in a race to find a fabled artifact, however at times this emulation can feel a bit solitary. While there are a few cards that suggest and promote player interaction like forcing other players to discard a card or two, there are not many mechanics in place to stop Thunderstone from feeling like multiplayer solitaire at times. Overall Thunderstone is a fun game, despite its quirks and shortcomings. It very well could have been the fact that my few runs through the game were only 2 player endeavors, perhaps with more people these elements change. I plan on running it with some friends and getting a 5 player game going on, once I do I will report back here with a short follow-up. There are also a multitude of expansions out for Thunderstone which are said to improve and deepen the game which I’ve yet to be able to play, as I was only playing the base game for the purpose of this review. 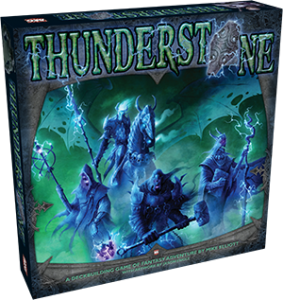 AEG is also in the process of creating Thunderstone Advance, which seems to be a new starting point for the game – both players old and new should be able to jump right into this version of the game and find it both a great starting point for beginners, and an improved feel for veterans. 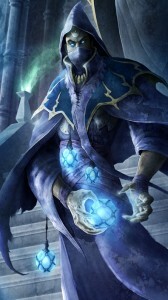 Judging by all the awesome stuff going on, on the Thunderstone website it seems like they have really cleaned up the layout of the cards, and added some cool new elements to the game like familiars and separate sections of the village like the “armory”, “marketplace”, and the “wizard’s college”. I’m really looking forward to checking out Thunderstone Advance when it releases, as I really liked the game and hope that this advance edition clears up some of my minor complaints. Thunderstone does have a lot of really cool elements like leveling up your heroes, dungeon crawls, and making a mad dash for an ancient artifact against your friends. It is a solid dungeon delving card game and honestly a lot of fun, especially if you’re a fan of D&D and other fantasy RPG’s. Despite any of its shortcomings, you should definitely check out Thunderstone for yourself! You can use this link to grab it on Amazon for 29$! Disclosure: We did receive a complimentary copy of Thunderstone to base this review upon.